So you have a dream, and you have a goal. But just having goals doesn’t get you any closer to meeting them. The first step towards becoming more frugal, meeting your goals, achieving financial responsibility (and all sorts of other good stuff) is building a budget. Why is it important to build a budget before you do anything else? Well, to paraphrase the song, it’s hard to know where you’re going if you don’t know where you’ve been. Here’s how I build a budget. When I first realized that I needed to get my financial situation under control, I didn’t know how to go about it. I just knew that I needed to see in black and white where all our money was disappearing to every month. On paper it always looked like we would have enough money to cover all the bills, but the bank never seemed to agree with our calculations. I knew I needed to track our spending, both past and present, but I didn’t know how. The first thing I did was create an excel budget template. Admittedly I’m somewhat of an excel geek (the making of the spreadsheet itself was a bit of a thrill), but it seemed to me that a spreadsheet was the best method to track my spending. As I mentioned above, I had tried putting pen to paper, and that didn’t work. Nor did I have money to go out and by a copy of Quicken or any other software program. After creating my budget template, I needed to fill it with information. So I started listing my expense categories, grouping them together in rough categories, like ‘Housing’ (rent, insurance, electricity and phones) or ‘Children’ (clothes, medical visits, outings and so on). (This image is a nicer version of categories than I could ever make in excel- it’s a screen shot of Pear Budget‘s excellent online budget, and a good starting point of ideas for how to separate your expenses into different categories.) 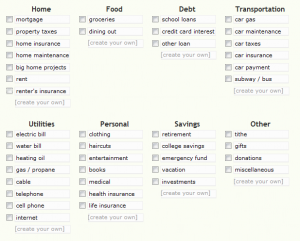 After I had created the categories for my budget, the template was now complete, and I only had to fill in our expenses. Here’s where my experience differs from some other accounts you might read. Rather than waiting to gather a month’s worth of receipts, and working forward from that point on, I started working backwards by going through three months worth of bank statements and entering information into my budget sheet. For me, this was the best way of approaching the situation; I was highly motivated to get my act together. Needing to save receipts and wait three months in order to have enough information to fill out the budget would have meant that the budget would never have happened. Instead I took advantage of my motivation and I was able to get a rough idea of where our finances stood with only a few hours work. Of course things weren’t as accurate as they could have been (I had almost completely stopped entering checks in the register for example) but I had a better idea of where we stood than before I started- and the news was both good and bad. Over the next three months, I entered my previous day’s spending into the budget every morning. I didn’t use receipts (I found that keeping track of them was a hassle), instead I relied on my bank’s online statements. Another crucial component to successfully building a budget was that I was not concentrating on controlling or lowering my spending. I only wanted to see where it went. I didn’t feel that I would be able to do both at the same time, and I knew that just by tracking what we spent we would spend less than we otherwise would. Once I had several months worth of information I was able to think about controlling our expenses, but we’ll talk more about that step next week! So there you have it: four steps to creating a successful budget. Create categories of spending that are meaningful to you- it doesn’t matter how many or few you have, nor how exact they are, only that they make sense and work for you. Enter your monthly spending into each of your categories, starting with your past records and then working forward. This is the hard bit, and you might feel a bit discouraged, but keep on plugging. Don’t worry about controlling your spending, instead start the habit of being aware of your spending. Controlling it comes next week! Next week’s topic will be controlling your spending. For that session to really be truly effective, it helps to have a budget in place! So the homework for this week is to set up your budget, following the four steps above as best you can. Do you already have a budget in place? What tools do you use to track things? Have you not developed a budget because it feels too scary? We do something very similar. My husband is an “Excel Geek” too and I’m so happy he is. He’s got his spreadsheets all linked and the information is so easy for someone like me to look at and understand easily. I love it and it didn’t cost us anything! I also use excel to do our budget. I did the same thing when I started mine. I went back two or three months to get an idea or what we had been spending on various items. Honestly, I have tried other software, like Quicken, and found that the spreadsheet is the easiest to deal with, that is, if you know how to set it up to do the calculations. I originally started with an Excel sheet, it’s the best way to begin learning how to at least keep track of your budget and what you spend. There are more options now that are very easy and simple for people as well. I also did an excel sheet and use our bank statements – and since my husband and I use our debit cards for EVERYTHING (we use maybe $40 of cash a month) it’s super easy to track. I split the budget up into specific categories once I caught on to our spending trends (books/magazines, gas station misc snacks), and then put those into the larger categories of Necessary (fixed needs), Somewhat Necessary (continuing education, website), and Unnecessary (eating out, shopping). 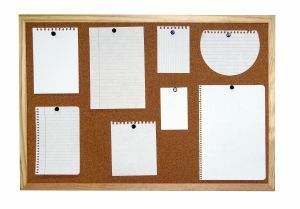 This way we can clearly see if our fixed Necessary expenses are staying fixed, and make sure that our Unnecessary items don’t get out of hand. First- love your blog! Hope you and your family are feeling better! I am actually in the process of putting a budget together. My husband and I are using mint.com (well he is more than me…) We have 2 kids and I am a SAHM. Since we’re on one income, we want, er, NEED to see where our money is going. I’ve looked in several methods of using cash only, which is something I am toying with, especially when it comes time to go grocery shopping. I used to hate the word budget. Now I am smitten with it! @Jessie, I LOVE how you’ve separated your categories! @Denise, thanks for the well wishes. It really is up to each and every person to figure out what works best for them, because if the system doesn’t work for YOU (no matter how well it works for somebody else) then you’re not going to use it, which puts you back in the same place as before! I don’t have a budget…I have three. I know, but it works for me, and allows me to play with more spreadsheets. 🙂 I have a monthly spending plan, an emergency spending plan, and a goal msp. (I don’t like to use the b-word). I do have a hard time tracking my spending because I have a tendency to change my habits when I know I’m looking over my own shoulder. I need this nudge to get my budgeting motivation back (again!) and get back on track. I’d better get started on that homework you’ve set, uh?! For the ultimate in budget planning, check out http://www.youneedabudget.com It takes the basics to the next level through the leverage of their awesome software system. It’s now beating out MS Money and Quicken at Amazon.